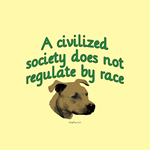 These anti-BSL items show the text "A civilized society does not regulate by race." and "Regulate by deed, not by breed." A bully dog head adds meaning. Fight BSL.